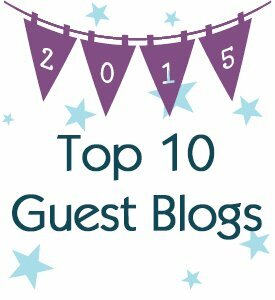 IDA blog makes top 10 thanks to the compassion and insight of Invisible Disabilities Association blogger Wayne Connell, founder of IDA, who is a regular contributor on Disability.blog by Disability.gov. The announcement that IDA made the “Top 10 Guest Blogs of 2013” on Disability.Blog by Disability.Gov brings joy to the entire team. We are thrilled to receive this recognition for building awareness and educating others about invisible disabilities! 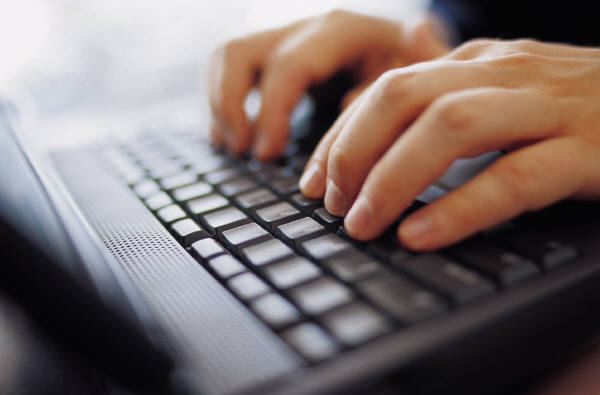 Wayne started writing as a commitment to help others better understand his wife’s challenges with Multiple Sclerosis, Lyme Disease, and Traumatic Brain Injury. This first-hand experience opened his eyes to a far-reaching need and led to the Invisible Disabilities Association. The Invisible Disabilities Advocate launched online in 1996 as Wayne’s communication with loved ones about what his wife was experiencing. Much to his surprise, messages poured in from people around the world. They were thankful to him and IDA for putting into words what they’d been trying to say to loved ones. Individuals seeking forgiveness for judgmental attitudes sent countless heartfelt messages. There were also stories of mended relationships between spouses, parents, siblings, and friends through the articles the website provided. Today IDA encourages, educates and connects people and organizations touched by illness, pain, and disability around the world. The delivery of this critical mission has led to hundreds of thousands of people finding community, support, and advocacy. Wayne runs IDA as a full-time volunteer while also working a full-time job and being a full-time caregiver. He builds awareness, education, and support through websites, books, pamphlets, articles, radio and television interviews, events, programs, and resources. He has launched several programs and campaigns. These include Awards Galas, Invisible No More, Invisible Disabilities Week, Brain Symposiums, Cleaner Indoor Air and Invisible Heroes. 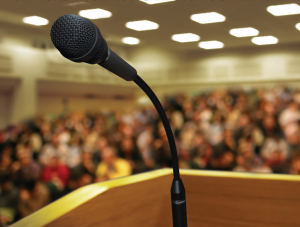 The IDA founder is also an author and speaker at conferences, seminars and for various companies. 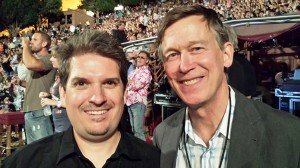 He has been a special guest on dozens of radio and television programs, regularly publishes advocacy articles online, in magazines and newspapers, blogs for IDA and Disability.gov. Wayne, with his wife Sherri, is the co-author of the book, “But You LOOK Good!,” with many sent all over the world to help friends and family better understand chronic illness and pain, as well as how to be a source of support to their loved one. 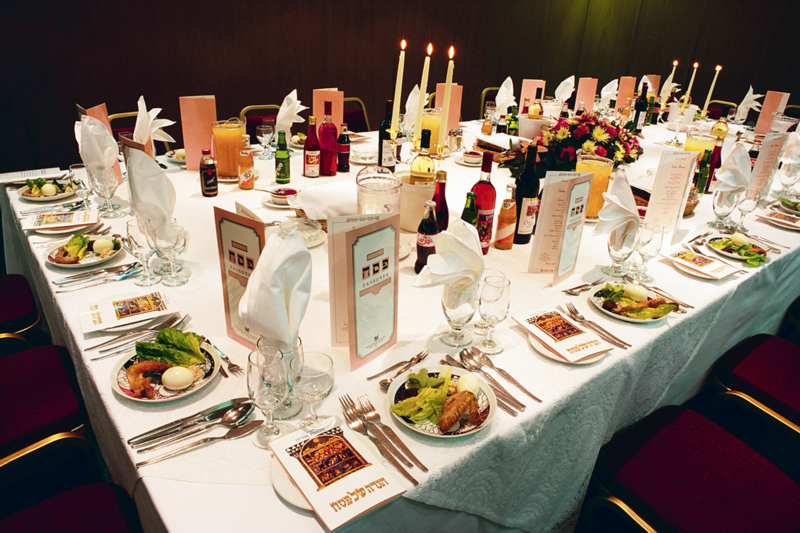 Since the establishment of the Invisible Disabilities Association’s Annual Award Banquets in 2008, we have asked our attendees not to wear perfume, cologne or fragranced lotions. We have done this, because millions of people have reported adverse health affects with exposure to the chemicals in synthetically fragrance products. We would like to share these quite bold and brave articles in response to our fragrance-free event requests. Thank you, Glory! 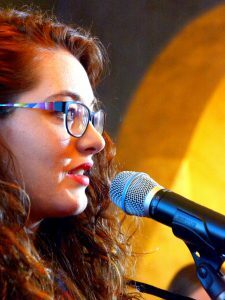 by Glory Weisberg, Society Editor the Fleurish Section, The Village Newspaper. Parker, CO – September 30, 2013. 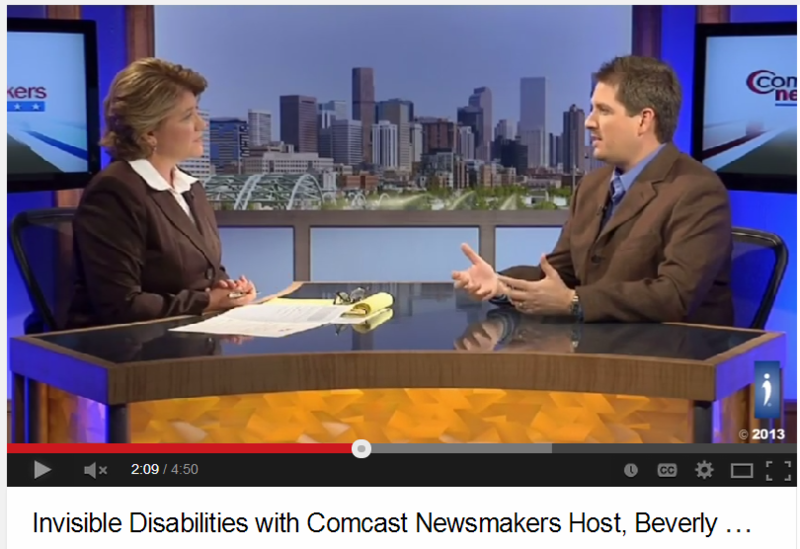 Comcast Newsmakers reporter, Beverly Weaver, interviews Invisible Disabilities Association Founder and President, Wayne Connell about invisible disabilities. This interview aired several times in September 2013. 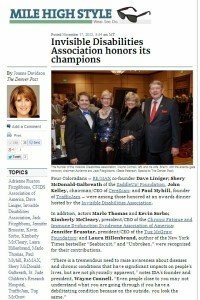 The Invisible Disabilities Association (IDA) is absolutely thrilled that The Denver Post took notice of the amazing work the IDA is doing to bring about awareness, education and support to millions of people living with debilitating illness and pain. IDA’s passion is to bring about a better understanding of medical disabilities that are not always obvious to the onlooker, in turn restoring relationships for those who live with debilitating conditions. 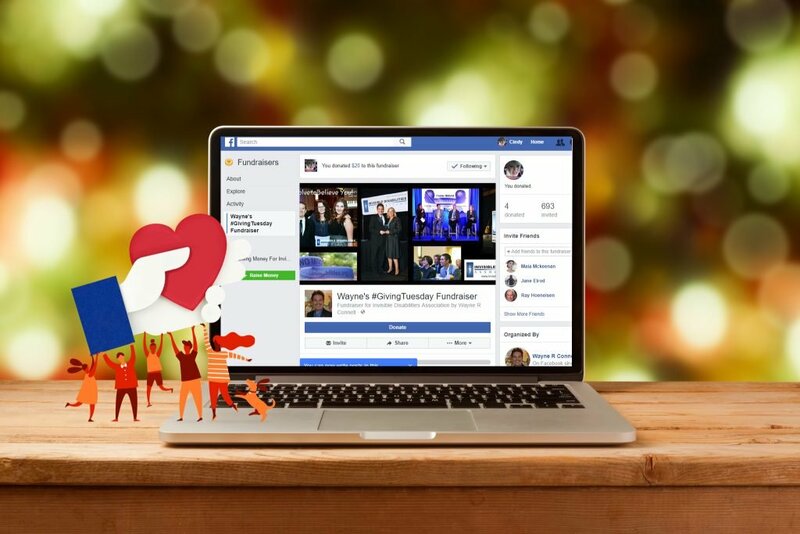 IDA does so through their websites, booklets, pamphlets, articles, seminars, events, videos, radio interviews and resources as well as our online community and social networks. 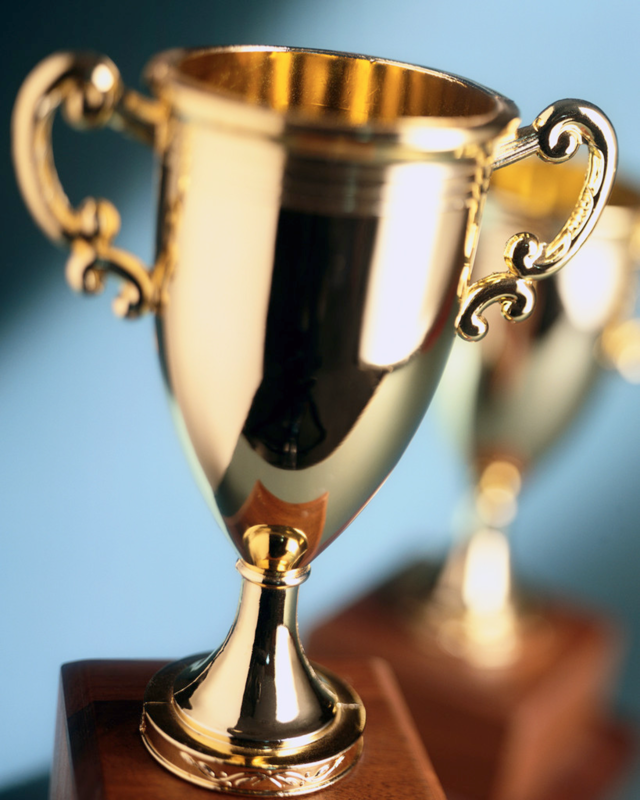 Annually, since 2008, IDA has given the IDA Honor Awards to individuals and organizations making a difference for those living with debilitating conditions. 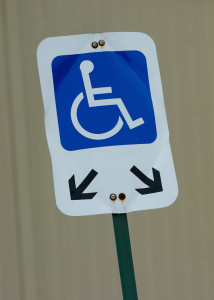 Annually, since 2008, the Invisible Disabilities Association has highlighted individuals and organizations making a difference in the lives of those living with debilitating conditions. We have done so by giving awards to incredible people across the nation. Some have faced challenges themselves, others simply have a heart for those who are hurting. We are honored to have Scottie Taylor Iverson spot IDA out of a crowd and join us on our amazing quest. Denver, CO – October 14, 2013. 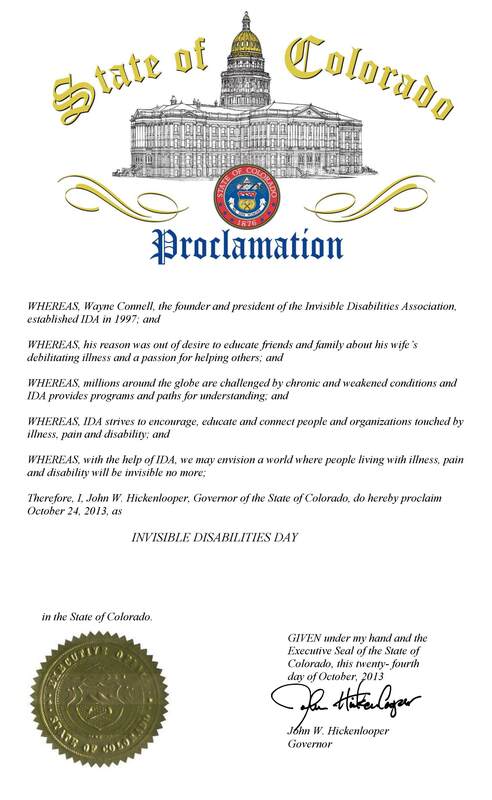 We are elated to announce the proclamation of Invisible Disabilities Day on October 24, 2013. 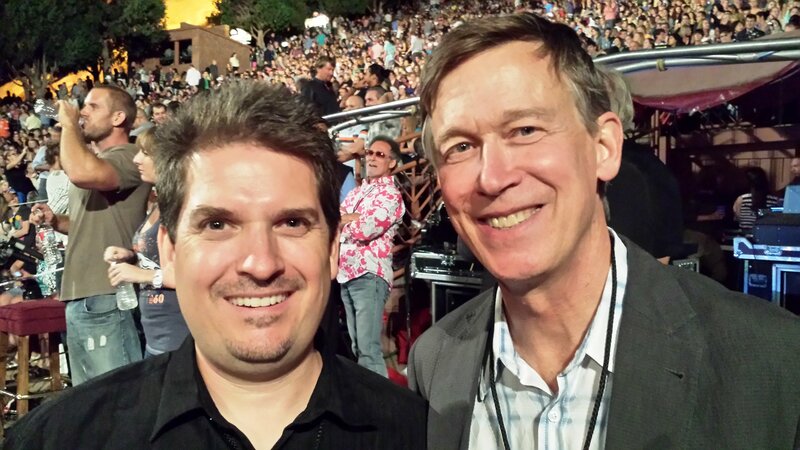 This day was brought into effect by Colorado Governor, John W. Hickenlooper. 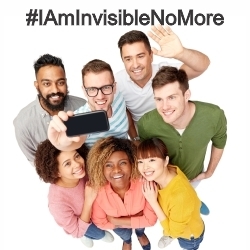 It was requested by the Invisible Disabilities Association in light of millions living with illness, pain and disability. The Invisible Disabilities Association (IDA) is a non-profit organization, based out of Colorado. IDA has been encouraging, educating and connecting people and organizations touched by illness, injury and disabilities around the world since 1996. 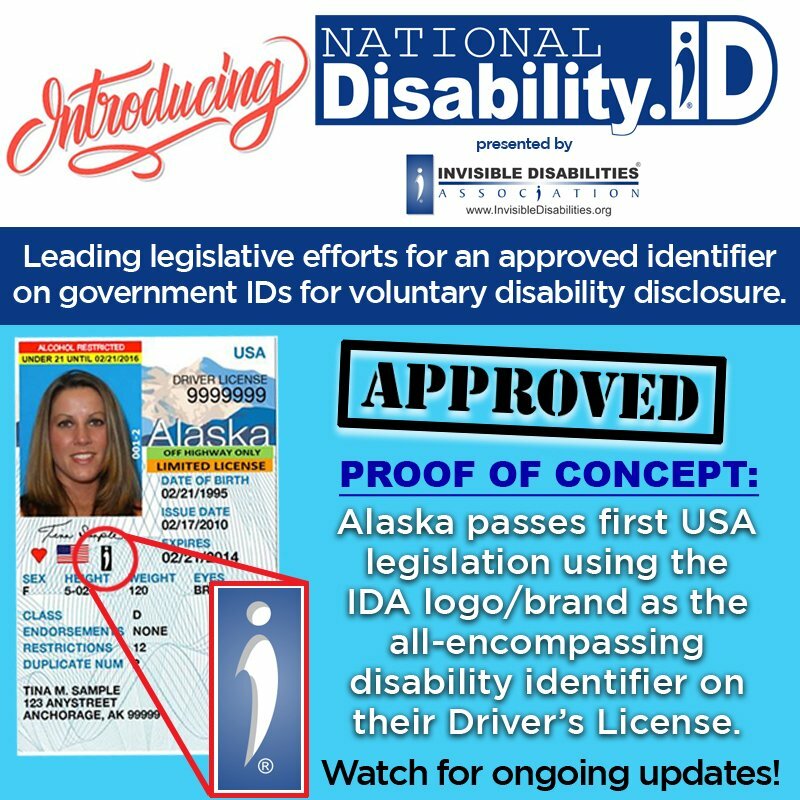 IDA provides awareness, articles, pamphlets, booklets, radio interviews, videos, seminars, events, resources, an online social network and much more. 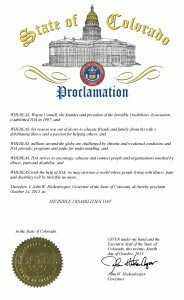 Therefore, I, John W. Hickenlooper, Governor of the State of Colorado, do hereby proclaim October 24, 2013, as INVISIBLE DISABILITIES DAY. 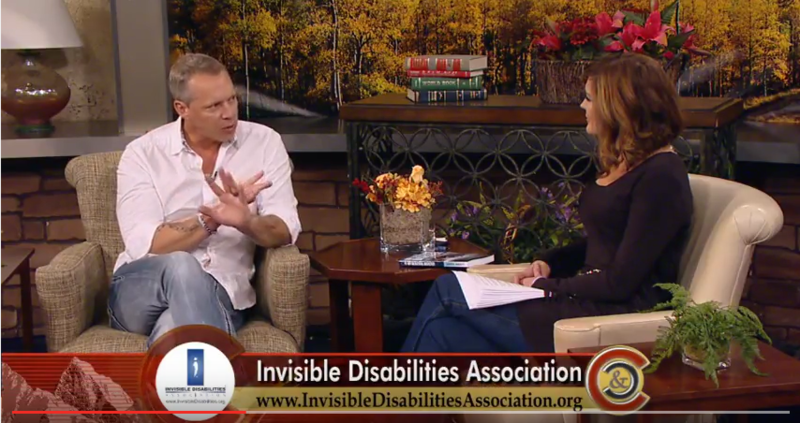 Join the Invisible Disabilities Association on Invisible Disabilities Day for “It’s Not an Illusion!” October 24, 2013 at 6 pm the Denver Marriott South. Invite your co-workers, friends, family, neighbors, community and medical teams for a thrilling evening for a great cause! IDA Founder and President, Wayne Connell, was Special Guest on Kidney Talk! Parker, CO – September 12, 2013. 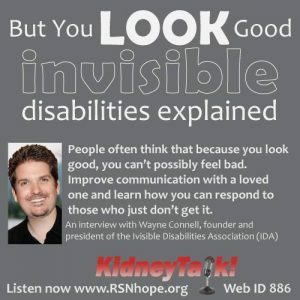 The Invisible Disabilities Association Founder and President, Wayne Connell was a Special Guest on Kidney Talk! on August 20, 2013. He discussed living with invisible disabilities with Lori Hartwell of the Renal Support Network. He shared awareness, tips and insights for understanding and supporting people living with all types of debilitating conditions. Listen to the interview online! Parker, CO – January 23, 2013. The Invisible Disabilities Association is thrilled to receive the “Best Booth Award” for Allsup’s True Help® Disability Web Expo. The free, online expo was held on September 27, 2012 and available on-demand through December 26th. 15 non-profit organizations were invited by Allsup to participate in the event. IDA presented 6 Video Interviews and LIVE chats with our experts. We also made informative pamphlets, hand-outs, videos and resources available to the attendees. The award included a $1,000 scholarship to IDA to help us continue to encourage, educate and support people touched by illness and disabilities around the world. This award was determined by the feedback and votes from attendees of the expo. Thank you everyone who attended and voted for us! Parker, CO – December 12, 2012. Wayne Connell, Founder and President of the Invisible Disabilities Association was honored to be a Special Guest on HUFFPOST LIVE produced by THE HUFFINGTON POST. Joining Wayne was Hall of Fame Speaker, Humorist and Nurse, Karyn Buxman, RN, MSN. Karyn is also an IDA Advisory Board Member, author of the book series, “What’s So Funny About…” and founder of Journal of Nursing Jocularity. Karyn has spoken at several of IDA’s events and was the recipient of the 2009 IDA Healthcare Award. She is the past President of the Association of Applied Therapeutic Humor and teaches nurses, businesses and people living with illness and pain how to use humor as stress-relief and therapy. Wayne’s wife, Sherri was also invited to share her insights and perspectives on living with invisible disabilities. Sherri lives with Progressive Multiple Sclerosis, Chronic-Late Lyme Disease and Chemical Injury. Once a very active young woman, singing and dancing in musicals, achieving multiple college degrees and enjoying her career, Sherri has been unable to care for her own daily needs since 1991. Sherri and Wayne were married in 1994. 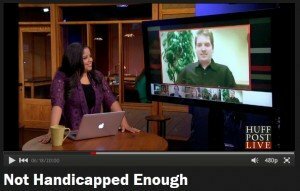 HUFFPOST LIVE producers were inspired to air this episode after reading an article from Elsa Sjunneson-Henry, “I May Be Disabled, But People Don’t Think I’m Blind Enough.” Elsa was also a Special Guest on the evening’s program. Thank you goes out to HUFFPOST LIVE and THE HUFFINGTON POST for airing this valuable information and awareness! Click the play button to watch!